Note: Craig Dworkin is a poet, critic, editor, and professor at the University of Utah. He is the author of five books of poetry, including Motes (2011), The Perverse Library (2010), Parse (2008), Strand (2004), and Dure (2004). 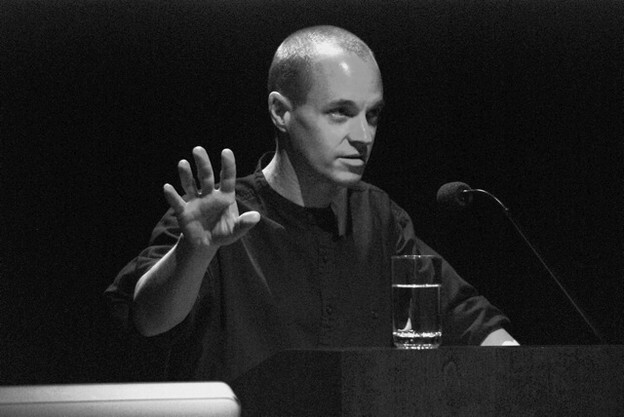 He has edited five volumes, including Against Expression: An Anthology of Conceptual Writing (2011) with Kenneth Goldsmith, The Sound of Poetry / The Poetry of Sound (2009) with Marjorie Perloff, and The Consequence of Innovation: 21st Century Poetics (2008); he is also the author of a critical study, Reading the Illegible (2003), and has published articles in such diverse journals as October, Grey Room, Contemporary Literature, and College English. He runs Eclipse, an online archive of radical small-press writing from the last quarter century. This interview was conducted over email throughout the summer and fall of 2011. Katie L. Price: The recently published anthology that you edited with Kenneth Goldsmith, Against Expression: An Anthology of Conceptual Writing, was a sort of expansion of the UbuWeb “Anthology of Conceptual Writing” correct? What prompted the original online anthology and when and why did you decide to expand the project into a book? Craig Dworkin: The online anthology (which — let’s be honest — is really more like an illustrated essay than a true anthology, despite the grandiose title) came from working in different disciplines. I was teaching in an English department, DJ-ing an avant-garde music show on the radio, and writing art history articles …. and I realized that these subcultures didn’t speak much to one another. So someone interested in a particular musical composition, say, had probably never heard of the literary work that was fundamentally — conceptually — very much like it. Indeed, I came to realize that a poem might well have more in common with a piece of music than with any other poem. So in part I wanted the UbuWeb site to make a case for reading across disciplines. At the same time, through my research I was discovering lots of interesting text-works from the ’60s, the moment of Conceptual Art (this was before the several, big, really useful anthologies and studies of the topic had come out), and I felt like there was a particular case to be made for a practice that was undeniably “writing,” but without the communicative, exophoric, expressive goals generally associated with writing. Now the print anthology, Against Expression, picks up on the idea of writing that is not expressive in the conventional sense; it collects texts that are not the result of unique, coherent, expressive subjects putting things “in their own words.” But it’s actually making a case that is exactly the opposite of the online anthology. Instead of being interdisciplinary, it argues for the importance of local social contexts, and it focuses on works that were published as literature. So it doesn’t include “outsider” writing, for instance (the symptomatic writing of the mentally ill); nor obsessive vernacular practices; or texts that were produced for a gallery audience rather than a book-reading audience, and so forth. Even when those texts look indistinguishable from the work that is included. Price: You’ve said that the arguments behind the illustrated essay, to use your term, and the print anthology are opposite. I’m wondering if this decision reflects not only your evolving research interests, but also a change in fields. For example, would you say that more scholars, writers and artists are reading across disciplines now and this makes the argument of the illustrated essay less immediately pertinent? Or that the anthology is partially a response to how conceptual writing has been recently received? In other words, how might you situate the two projects themselves historically and socially, especially when, as you say, the texts in them might appear indistinguishable? Dworkin: I don’t think there’s been any sudden sea-change. Disciplines have a strong gravitational pull. Though at a very small scale — on the level of specific individuals — I can certainly think of people in the art world who are now looking more to literature, and vice versa. Michalis Pichler, in Germany, for instance, or the Information As Material collective in England, or the kind of scene that has been developing in Los Angeles, say. Andrea Andersson is curating a museum show of conceptual texts at the intersection of the gallery and the page. And it’s not coincidental that the US launch of the anthology was at MoMA, and the UK launch will be at the Whitechapel Gallery. However, a couple of longer-term historical shifts are legible in the discourse around poetics. The first has to do with appropriation. In the 1970s, poets were constructing poems from entirely appropriated material: Charles Bernstein’s “Asylum”; Lyn Hejinian’s Gesualdo and Writing Is an Aid to Memory; most of Clark Coolidge’s Ing, and so on. But appropriation and procedure are rarely mentioned back then. The poets themselves either don’t say anything at all, or they don’t make a big deal about it if asked. Reviews and critical articles might say that a work “sounds like” it is citational, or that it’s “tempting to speculate” on their sources, but that’s it. Whereas today, the fact of appropriating a source is the first thing a poet will say about their work; it’s how poems are introduced at readings and how books are advertised. Back in the 1990s, Lyn Hejinian was reluctant to admit that were any sources at all in Writing Is an Aid to Memory, but she now recounts the procedure as a matter-of-course. So something fundamental has shifted over that last decade or so. The other big change has to do with the rhetoric around readability. “Opacity” and “illegibility” were key terms in the language of value for avant-garde poetry in the ’70s and ’80s, when the recalcitrance of a text was aligned with other forms of political resistance. The most exciting poetry was often agrammatical or asemantic, and appropriated fragments were collaged in ways that heightened disjunction. Today, that’s no longer the case. It’s not that the poetry today is any easier, or more complacent or complicit, but the areas of interest and attention have shifted. And this is always one of the difficulties for readers when poetics shift: we too often expect the work that follows an earlier avant-garde to continue to look like that older mode, when in fact influence and imitation are very different things. Price: I had never really thought about poetry introductions being such vital pieces of the puzzle of literary history, but it makes perfect sense, so thank you for that. But I’d like to ask you two questions. You characterize avant-garde poetry of the ’70s and ’80s as agrammatical, asemantic, and disjunctive. This seems to be the standard and accepted reading of the avant-garde of that time. For example, I’m reminded of Juliana Spahr’s The Transformation, in which she repeats the phrase “fragmentation, quotation, disruption, disjunction, agrammatical syntax and so on” almost to the point of absurdity. I wonder if you had to characterize the values or characteristics of the 1990s and 2000s what you might say? In your mind, are the key terms mostly the same but just used or understood differently? Or are the characteristics of more contemporary poetry different entirely? Which leads to my second question: How do you see your own work, both with the anthology and works such as The Perverse Library or Parse, addressing these questions? Dworkin: Well, this is all from a very distant, generalizing perspective; I should be quick to note that there is certainly astonishingly good work being published today that doesn't fit either description (Joseph Massey, for just one example, is one of my favorite poets). And Peter Inman, for a very different example, is publishing exciting, masterful new books that make good on the rhetoric of the ’70s avant-garde in ways that the actual poems from the period seldom did: “agrammatical, asemantic, and disjointed” in the extreme. But in general, from a certain remove, I do think we’ve seen the basic characteristics change. Which is precisely why I wanted to publish the anthology. The number of texts manifesting those new characteristics had reached a critical mass. When Kenny and I first started talking about the anthology, we had a handful of examples in mind and figured we’d find a few more; by the time it was in production at Northwestern, new books of what we would consider “conceptual” writing were being published weekly, any of which could have been centerpieces in the anthology. As a scholar, I’m interested in moments like that, when the literary landscape changes dramatically, and I wanted to document that moment in the first years of the twenty-first century when modes of “conceptual writing” were newly relevant to such a rapidly growing number of writers. As the anthology is at pains to demonstrate, these modes were not unprecedented, but they were operating with a newly visible significance for many writers. None of which, I should add, makes Conceptual writing somehow “better” than what came before — I don’t subscribe to a progress model of literary history — and none of which suggests that people ought to write in this way (I’m always surprised by the panicked fear Conceptual writing can elicit from other poets, as if they’re going to have to abandon their writing and be forced to transcribe newspapers for the rest of their careers …). As to my own poetry, Parse is actually a good example of how the coalescing of similar writing in the 2000s changes the light in which we see such works. At the time I started the book, in the mid-1990s, there was no such thing as “conceptual writing.” I was primarily interested in postwar art (something like Mel Ramsden’s series of “100% Abstract” paintings were a direct inspiration, but also Robert Smithson, John Cage, minimalism, et cetera), renegade surrealism (Bataille and the Documents group; René Daumal and Le Grand Jeu group; late Dada works; et cetera), and a scattershot of other modernisms: OuLiPo; Russian Futurism; Gertrude Stein; Mina Loy … And although I was reading a lot of poetry in the Language tradition, the relation of that poetry to Parse was indirect; it granted the necessary permission to write abstract, non-communicative works, but nothing they were doing looked anything like a parsed grammar book. Similarly, I was profoundly inspired by Darren Wershler and Christian Bök, who were important friends and role models for me, but works like The Tapeworm Foundry and Eunoia were still years off. I knew about No. 111 from teaching art history, but I wouldn’t meet Kenny and find out about Soliloquy and his new writing projects until 1998. A dozen years later, against the background of the anthology and all those other books, Parse suddenly makes much more sense, and it seems to take part in a conversation that it wasn’t really able to have back in the ’90s. Price: As you say, the conversation has changed surrounding books that use what we might call “conceptual practices,” although exactly what that means, I think, is still up for debate. I’ve noticed this change even in just the last four years — four years ago I often found myself having to justify my interest in “conceptual writing,” and even, at times, its precedents. Now it seems, even if “conceptual writing” still elicits anxiety, tension, or downright anger from both poets and critics, the mere proliferation of these techniques has rendered a conversation about these texts, and conceptual practices or techniques, necessary. Would you mind talking a bit more about how the writing of your colleagues influences the projects you undertake and how you understand your own work? 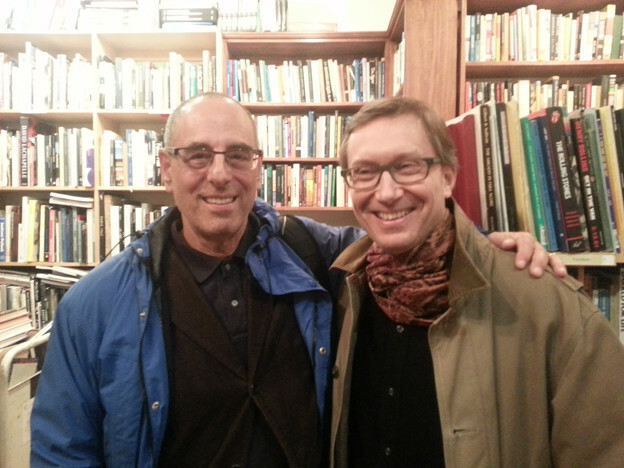 You mentioned that Kenneth Goldsmith and Darren Wershler were particularly influential. What types of conversations do you have with each other? And do these directly influence the projects you undertake and the way in which you undertake them? Dworkin: I can certainly name a few of the ways that conversations with Christian Bök and Darren Wershler initially — and then for many years with Kenny Goldsmith — and then more recently with Brian Kim Stefans and Rob Fitterman as well, have had a direct influence on my writing projects. Most importantly, they’ve always provided the right combination of permission and provocation: contemporary models of going all the way (I always think of Blaise Cendrars’s line from La Prose du Transsibérien: “j’étais fort mauvais poète. Je ne savais pas aller jusqu’au bout”) and then the challenge to go even farther. Plus, we’re good enough friends to give bluntly honest assessments, and to trust each other’s judgments in turn: we’ve all had books we thought were completed and polished and ready for press …. until one of the others challenged us to push the project to another level. I don’t think I’m giving anything away to say, for instance, that Christian completely reconceived and rewrote Eunoia, ratcheting up the content to match the formal bravura of a first version, after sharing it with a few of us. In the end, these are the readers I’m writing for. And because the projects are in dialogue with one another, those projects in many ways are the conversation. Now, I’m not sure any of that is any different from what all writers experience; but as you might expect, the nature of those conversations is not at the level of local craft concerns — tweaking particular lines of discrete poems, say — but rather at the broad level of testing and proving the conceptual parameters. The most practical questions tend to be about paratexts (how much explanatory apparatus should accompany a work? ), or the fit of form to content — but mainly it is a conversation, at all levels, about how to realize the full force and rigor and elegance an unexpected intellectual investigation might achieve. Price: The last thing you said reminds me of a line from your introductory essay to the UbuWeb “Anthology of Conceptual Writing,” that the test of this poetry is “no longer whether it could have been done better (the question of the workshop), but whether it could conceivably have been done otherwise.” I’m interested in this notion that if a work is “done otherwise,” it is actually a completely different work and how this relates to the scientific vocabulary you used in describing your interactions with certain colleagues: “testing and proving,” “explanatory apparatus,” “intellectual investigation.” The model here seems to be that of a laboratory of literature: writers and thinkers working side by side to discover the unexpected. At least that’s one of the things I find most interesting about conceptual literature, and particularly your work. Would you mind talking a bit about how you and your colleague’s work relates to science — and perhaps even if this characteristic of “intellectual investigation” at all influenced the decisions to include or exclude certain works in Against Expression? Dworkin: Marjorie Perloff has said “I don’t especially care for the word ‘experimental,’ which implies that the poetry in question is just an experiment, that it may well fail,”  but I like the word for precisely that reason: the suggestion that poetry can tell us something we didn’t know before — not because it communicates some wisdom or knowledge or insight from the author, but because its structures — the process of its composition and the specifics of its final form — reveal something in and of themselves. This is also where the idea of the experimental links up to the conceptual: neither is primarily about expressing or communicating. Rather, they are primarily about framing and asking and recording. There is also a sense in which the experimental frees the audience as well, since the poem, in some sense, is written not so that it caters to the reader, but so that it serves Poetry — an experimental poem is written for language. What happens if you alphabetize five-syllable phrases ending in an “r”sound? What happens if you restrict yourself to only one vowel? What patterns emerge from a parsed text? How many chemicals make up a printed page? We learn more, with such works, about language itself than we do about their authors. But to answer your question more directly: the closest relation to science would surely be found in Christian Bök’s Xenotext Experiment. There, Christian has taught himself an extraordinary amount of genetics and biochemistry, is working directly in the lab with credentialed scientists, and has published the work in science journals more than in poetry journals. And in that work you can catch a glimpse of the crossroads Conceptual Writing is going to come to: whether to turn its back on conventional poetry (Christian is speaking more to non-poets with that project than to other writers) or to challenge the comfortable status quo directly (as Vanessa Place is doing). 1. See The Grand Piano: San Francisco 1975–80, part 3 (Suburban Detroit: Mode A, 2007), 61. 2. Marjorie Perloff, interview with Enrique Mallen, S/N: New World Poetics 1, no. 1, ed. Charles Bernstein and Eduardo Espina, 26.